Do you have an underwater photography session scheduled during your trip to Cancun, Playa del Carmen, Riviera Maya, Cozumel, Isla Mujeres or Tulum? 1. Make sure to schedule a morning session. The light is always best in the morning plus you are likely to get beautiful sun rays beaming through the water. 2. When choosing your location, a cenote or pool is always a better option than the beach. The ocean water tends to be murky and it’s hard to open your eyes in the salt water. A cenote has natural spring water and is very clear for underwater photos as is a pool. 3. Choose a simple, flowing wedding gown or summer dress for your underwater session. A heavy dress can sometimes weigh you down when swimming while a light dress will allow you to swim freely and safely. Safety is always key in any underwater trash the dress session! 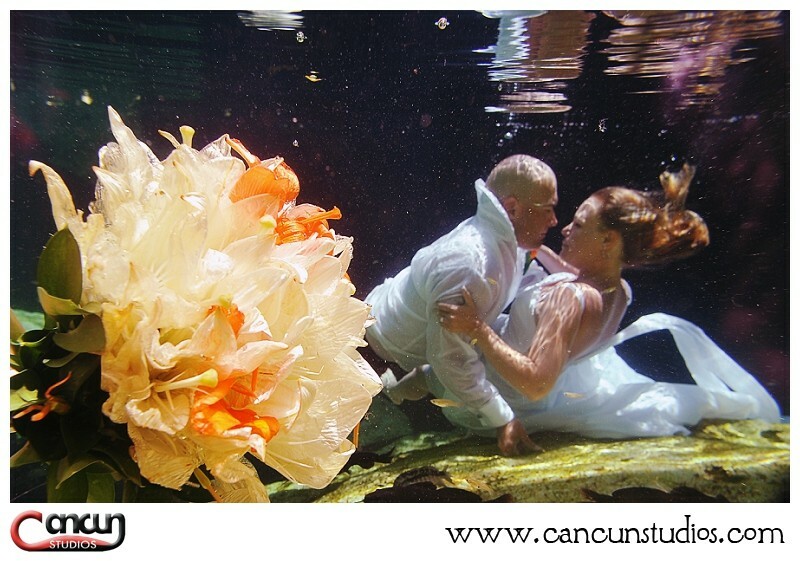 Cancun Studios is your number one option for Underwater Photography in Cancun and the Riviera Maya! Thursday Trivia – What color is the sand in Cancun?